Island Dreams' owner Ken Knezick recently returned from a Palau dive cruise aboard the Big Blue Explorer. 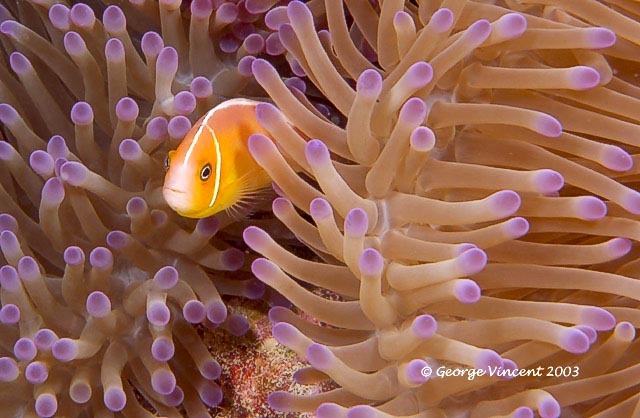 In addition to enjoying a great week of diving with an Island Dreams group, he took the time to reacquaint himself with a wide variety of Palau's other live-aboards, land-based lodging and diving opportunities. This report will endeavor to help you to select the situation that best suits your needs, and to make the most of your own Palau diving adventure. Getting There - Continental Air Micronesia, now branded as part of United Airlines, has long been the primary carrier for travel to Micronesia. With frequent flights, and feeder airfares from around the USA, getting to Micronesia, and travel between the various islands is a relatively simple affair. Most all Micronesia travel uses the very modern Guam airport as its hub. Arrival in Micronesia - Despite the fact that you fly thousands of miles to get there, this place is more familiar and similar to the USA than any Pacific diving destination other than Hawaii. It is served by a U.S. flagged airline. Currency is the U.S. dollar and English is widely spoken. Even the local stores carry many familiar products. Micronesia offers a very easy and comfortable situation for travelers from around the world, and especially those from North America. Palau, Truk, Yap, Pohnpei - While this report concentrates on Palau, over the years I have been fortunate to visit most of Micronesia's fabled diving destinations. 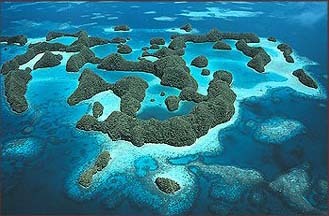 Palau is perhaps the best known; with Blue Corner topping the list of many divers all time favorite dive sites. Truk Lagoon is famous to anyone with a knowledge of WWII, or a serious interest in some of the world's absolute finest wreck diving. Yap has become justly renowned for its diving with Manta Rays, but its reef diving is also excellent, as is its cool new Mandarin Fish Dive. Pohnpei, much less well known, also has a lovely dive resort, great diving, and a truly unusual topside experience in the ruins of Nan Madol. All in all, Micronesia is truly a divers' delight. The Palau Experience - While downtown Kuror may be somewhat lacking in charm, Palau's fabled Rock Islands offer some of the most beautiful ocean scenery in the world. The majority of international tourism comes here for one reason, world-class scuba diving. This is not a new discovery, Palau has been known for decades. At this point there are a great variety of lodgings, dive shops, and live-aboards ready to serve divers of every budget and temperament. The best dive sites, while clustered together in a few regions, are relatively a long boat ride (30-90 minutes) from shore. Thus Palau is a particularly good place to dive from a live-aboard. Following are what I believe to be some of Palau's standout diving opportunities. Palau Aggressor II - Though I did not have the pleasure of cruising with Aggressor this trip, I did make a point of going aboard to tour the Palau Aggressor II. Built in 1994 specifically as a dive vessel, she certainly is an impressive craft. Her 2100 horsepower jet drives are capable of moving this large vessel at a speedy 21 knots. At 106 feet in length, with a 30-foot beam (width) due to her catamaran hull, there is plenty of space for all the amenities a diver could wish for. A maximum of sixteen guests are accommodated in eight double occupancy staterooms equipped with individual climate controls. A significant feature is the 30-foot dive skiff which accommodates all the divers and is launched, fully loaded, via hydraulic lift flush with the rear of the dive deck. While I did not have the pleasure this time around, from previous experiences I can assure you that Aggressor's Captain and crew are top notch and ready to serve you on this excellent vessel. Ocean Hunter - This 60 foot private yacht, accommodating a maximum of just six guests, provides a substantially different experience than that of the larger boats. Run lovingly by Tova and Navot, also Managers of Fish n Fins dive shop, Ocean Hunter is a top-notch operation with an enviable 60% return guest quotient. If you are willing to forgo certain creature comforts in exchange for a much more personal diving experience, then Ocean Hunter is an excellent way to go. 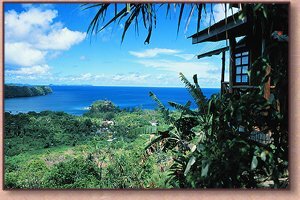 West Plaza Hotels - This local group has five small hotels in Palau. They are not fancy, but a good value with a clean, air-conditioned room. To my mind, the best of these five is the West Plaza By the Sea, which has a nice open-air restaurant on site, and is a short walk to a shopping market. Other good West Plaza options are the Coral Reef, and the downtown West Plaza Desekel. Caroline's Resort - Built island-style, with a balcony overlooking a verdant swath of jungle and the ocean, Caroline's is definitely an Island Dream. The room is air-conditioned, while meals may be ordered (at additional expense) and served on your private outdoor veranda. The entire resort is comprised of only eight individual bungalow rooms, so book well in advance if this is your cup of tea. Sunrise Villa - Though in an equally attractive island setting, Sunrise Villa is a more modern style of hotel, offering the largest rooms on the island. The view from the air-conditioned restaurant is lovely, and there's even a fancy cigar bar. A swimming pool and deck is located on a hill one level above the hotel. Palau Pacific Resort - If 5-star luxury is your style, and your champagne taste comes with a similar budget, then the Palau Pacific is your place for comfort and top quality service. There's a fine full service dive shop on site, but you may prefer to avail yourself of one Palau's excellent private dive operations. Fish 'n Fins - This excellent shop was founded by native Francis Toribiong in the earliest days of Palau diving. Today it is the longest operating shop on the island with a very well established reputation. While Francis is still in the mix, day to today operations are now in the hands of a very sharp and capable team of Israelis, Tova Har-El and Navot Bornovski. Their energy and creativity will assure that Fish 'n Fins continues to be a preferred Palau diving service. Sam's Tours - American Sam Scott founded Sam's Tours in 1990. Due to his capable management and service-oriented attitude, it has quickly grown to become a popular favorite among dive travelers to Palau. A PADI 5-star Resort, Sam's Tours offers great diving services plus a Photo Pro, Game Fishing, and Kayak tours. Neco Marine Dive Center - Neco Marine Dive Center is a PADI 5 Star/Gold Palm IDC Center. They have comprehensive dive shop and marina facilities, as well a large and modern fleet of high-performance dive boats. In addition to daily diving excursions, Neco Marine offers a full range of PADI experiences and dive courses, from the introductory Discover Scuba Diving Experience through full Open Water Scuba Instructor training, plus a wide array of Specialties and photo and video services. Planet Blue Sea Kayak Tour - A marine biologist by training, Planet Blue is operated by Ron Leidich. Located in-house at Sam's Tours, with operation and its owner seem perfectly suited to Palau's calm, protected waters and beautiful Rock Islands. Led by paddling guides who are experienced naturalists, Planet Blue offers everything from half-day paddles to multi-day kayak safaris. I can not think of a more delightful place in the world to pursue this exciting and rewarding on-water activity. (Contact Island Dreams for additional information). Palau's Diving - For my nickel, it is the variety of diving that really makes this destination worth the trip. Palau is justly famous for its big fish activity, schooling sharks, manta rays, the amazing Jellyfish Lake, a great Mandarin Fish dive, some awesome cavern dives, and even a few excellent WWII shipwreck dives. When divers ask, where are the big fish? The answer is at Palau, cruising around Blue Corner for you and me to marvel at! However, I feel obliged to also mention that in 1998 Palau suffered from an increased ocean water temperature bubble that troubled much of the Indian Ocean and equatorial Pacific coral reef areas. Many of the hard corals, sponges and invertebrates of the reef died or were seriously reduced in number. In places this phenomenon is still evident to the trained eye, but today Palau's reefs continue to experience subsequent re-growth. Fortunately, this has not in any way degraded Palau's reputation for, or population of, big fish and other critters. The frequent sightings of sharks, rays, Napoleon wrasse, bump head parrot fish, big pelagic tuna, giant-sized snapper and other major denizens of the deep make Palau a true divers' delight. Micronesia Seasonality -Located seven degrees north of the Equator, seasons are on a schedule similar to that of Central America, pretty much warm all year round. Traveling from Texas, I felt quite at home with Palau's heat and humidly. As to diving conditions, I appealed to an expert, Tova of Fish 'n Fins, for a description of the diving seasonality. She wrote: "Hi Ken. This is not easy to answer as the weather patterns have changed all over the world. Normally Palau's rainy season is July through November and the dry season is January to June. However we had a very wet February and a dry November, so go figure. Water temperature hovers around 86 degrees Fahrenheit all year round. Shark mating season is February to April. Moorish Idol migration is in March. The Groupers spawn in May and June. Manta Rays are expected December through February (but we saw about six mantas today and its May!)." Dive Suit - Water temperature is relatively mild. A lightweight Caribbean-style wetsuit is fine year round. I recommend divers use a full suit, if only for the protection against stings and abrasions. Underwater Photo Gear - In the water you will find application for both wide-angle and macro set-ups. As the sharks may not always approach very close, a mid-range zoom lens, such as the Nikkor 24-50 mm, may provide better results than a 15 or 20 mm. To capture an effective image of the mandarin fish will require a 105 mm macro lens, plus plenty of film and patience. Nitrox Certification - Palau diving is well suited to the use of Nitrox. The enhanced percentage of oxygen adds to your safety level, helps to alleviate fatigue, and enables you to feel warmer. If you are not already Nitrox certified, the live-aboards and land-based operators all offer certification options. On the Boat - Clothing requirements are delightfully simple - a few t-shirts and shorts, and one pair of walking shoes for the shore excursion. For comfort, bring multiple, quick-drying bathing suits so you will always have a dry one. Should it prove cold in the evenings, have at least one long-sleeved shirt, and perhaps a lightweight jacket or pullover. Shore Excursion - World War II buffs won't want to miss the ½ day shore excursion to Peleliu Island. The history here was written in blood, with more than 12,000 lives lost in a two-month campaign in the fall of 1944 to take the island from the well-entrenched Japanese. Now, some sixty years later, the land still bears testimony to the struggle, with a scattering of rusting tanks, caisson guns, and other war paraphernalia. A small museum and the services of a knowledgeable guide make this tour a very interesting, as well as sobering, experience. The Bottom Line - Though it's still a long ride, Continental Air Micronesia makes the trip from the USA as time efficient as is possible. Big Blue Explorer is a spacious and comfortable dive platform, served by as fine and friendly a crew as any I have experienced. Palau Aggressor offers an even more luxurious live-aboard option. A variety of land-based hotels and dive operators offer everything from budget to big-ticket opulence. Palau's diving, while it has its high-current moments, is really quite easy and enjoyable, accessible to divers of all experience levels. The variety of everything from sharks and dolphins to Jellyfish Lake and a superb mandarin fish dive makes this a standout dive trip I'll be happy to repeat. Copyright Ken Knezick - Island Dreams, Inc.